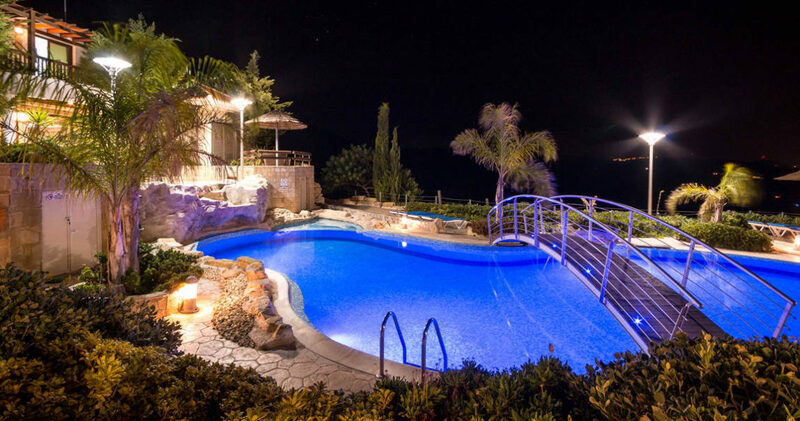 Panorama Villa is a beautiful holiday villa for rent in Cyprus in Peyia Hills, Paphos. 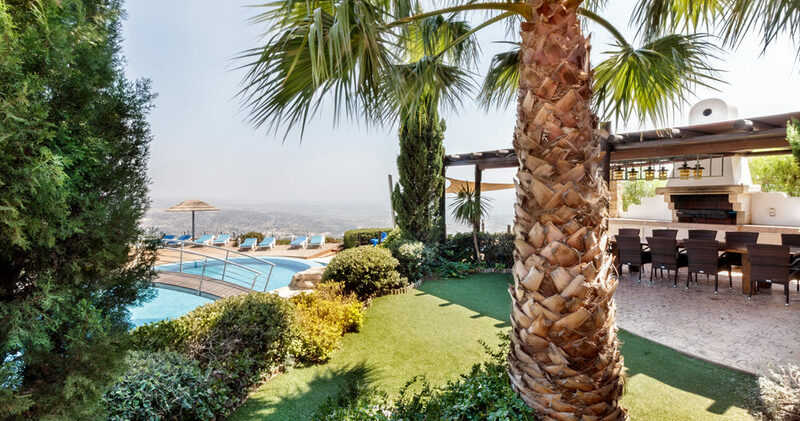 Neighboring its modern successor, Oceania Villa, it is located in a private rural area with a panoramic view of the city of Aphrodite, Paphos. 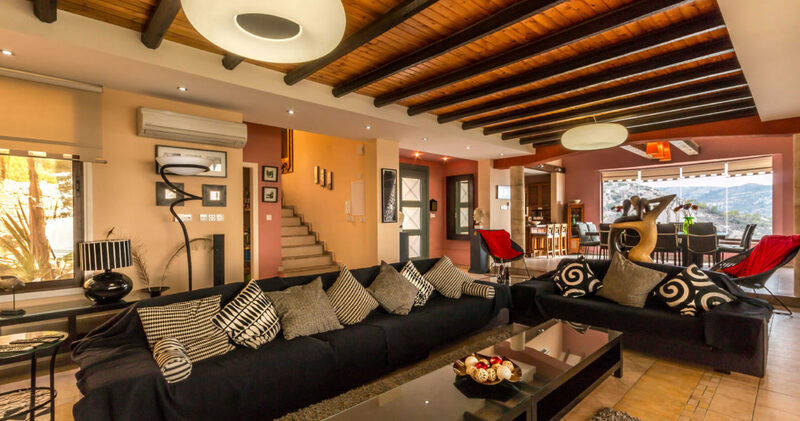 The villa owner, a Cypriot architect, designed the villa as a rustic building, with a contemporary interior. 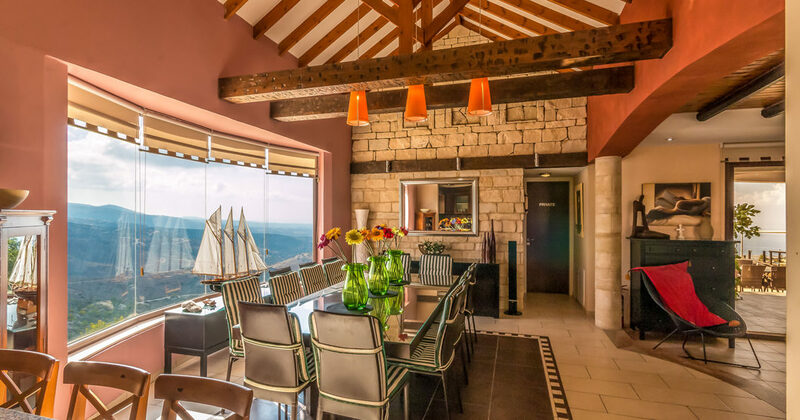 The interior and exterior materials that were used to decorate the villa, are in natural tones providing a feeling of comfort and suitable environment for family vacations. The luxury villa is composed of the main house and the annex. With 6 bedrooms Panorama Villa can sleep up to 15 guests. At the ground floor of the main house is the living area which is surrounded with large glass patio doors looking out over the mosaic pool and garden area, while allowing the warm sunlight to flow into the house. The rest of the ground floor comprises of a fully-equipped kitchen with a 12-seat dining table and an additional smaller kitchen with a separate utility room. In the living room you can find plush sofas, a 52 inch TV with surround system, DVD and satellite stations and a beautiful cozy fire place. 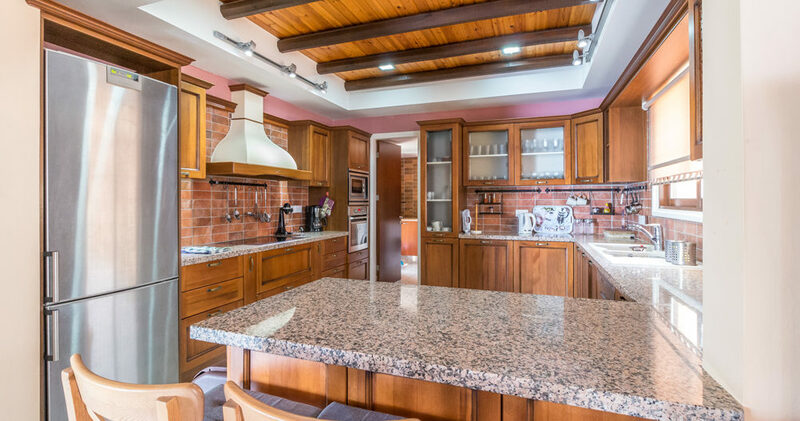 In the kitchen area you can find all the necessary kitchen appliances for your daily home cooking. A breakfast bar, cupboards for storage, a fridge/freezer, a microwave, an oven and a dishwasher, are also available for your ease. In the separate utility room, which can be accessed through the kitchen, comprises of a washing machine, sink and an additional gas hob and oven. 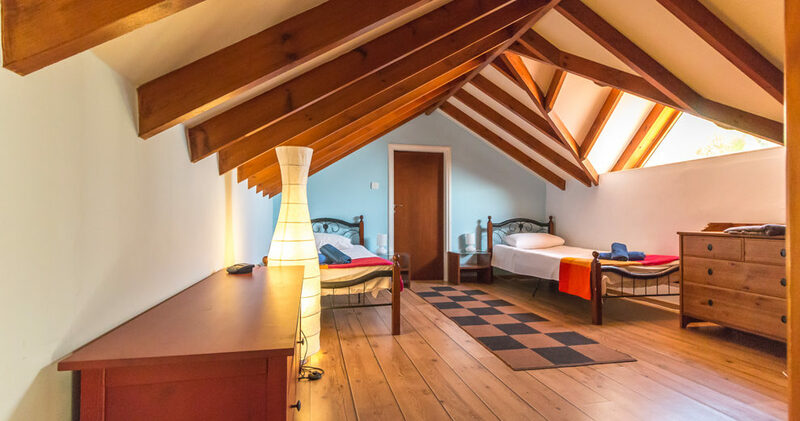 On the first floor of the main house, you can find the master bedroom, with a double bed, an en-suite bathroom and a TV connected to the ground floor's satellite system, as well as a twin bedroom with en-suite shower. 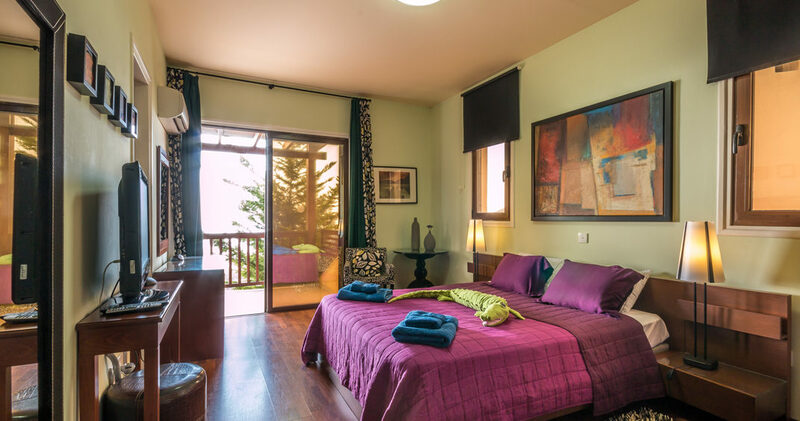 Both rooms have a shared access to the first floor's balcony which offers a breath-taking view of Paphos and the Mediterranean Sea. 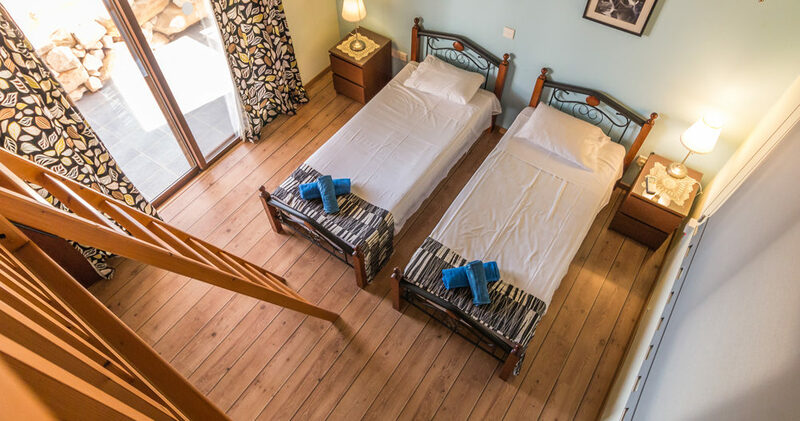 For larger families, looking to spend their holidays in a villa in Cyprus, additional accommodation can be found since there is a separate wing attached to the main house where two twin bedrooms with a shared ''Jack & Jill'' bathroom are located on the ground floor. 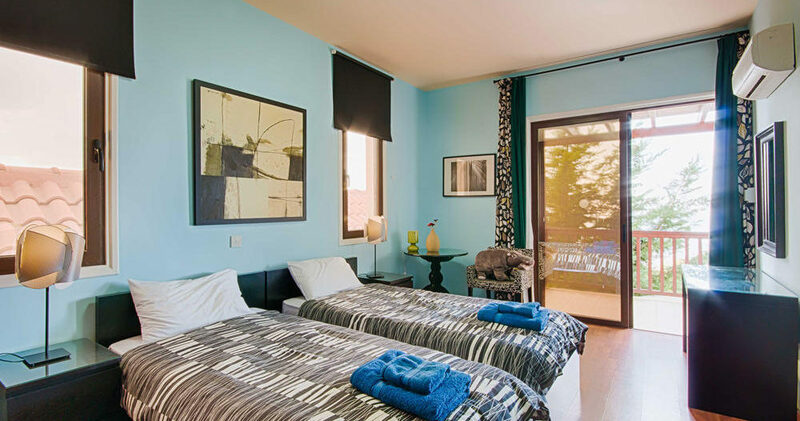 Also, one of the rooms has an extra mezzanine level with two single beds suitable for children. In the separate annex, at the ground floor, there is a large double bedroom, an open-plan kitchen and a living room with glass patio doors that lead to the outdoors barbeque area. The living room has a flat screen TV and a DVD player, while the kitchen is fully equipped with an oven, electric and gas hob, fridge/freezer, dishwasher, cupboards and a small dining table for 5 guests. Accessible from the living area, there is also a family bathroom with a washing machine. An upper mezzanine with two single beds and an en-suite toilet can be found, through a wooden staircase from the living area. The highlight of the villa for the perfect family vacation is the expansive outdoor landscaped living area for the comfort of our guests. It has a private, infinity shape, mosaic swimming pool with the unique addition of a deck bridge. A patio deck was added recently for a more relaxation and for larger wedding ceremonies and receptions. 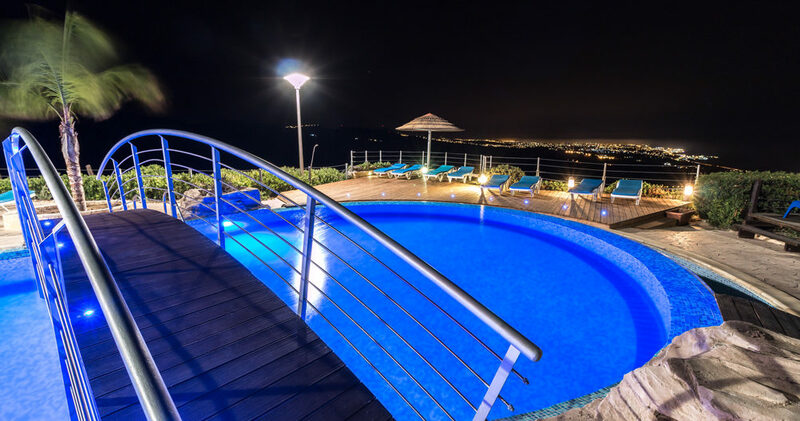 You can enjoy a swim under the sunlight or for more romantic occasions, under the moonlight, since it has colourful underwater lights which can be adjusted accordingly. There is also a smaller swimming pool suitable for children and a luxurious Jacuzzi, available on request with an additional cost. 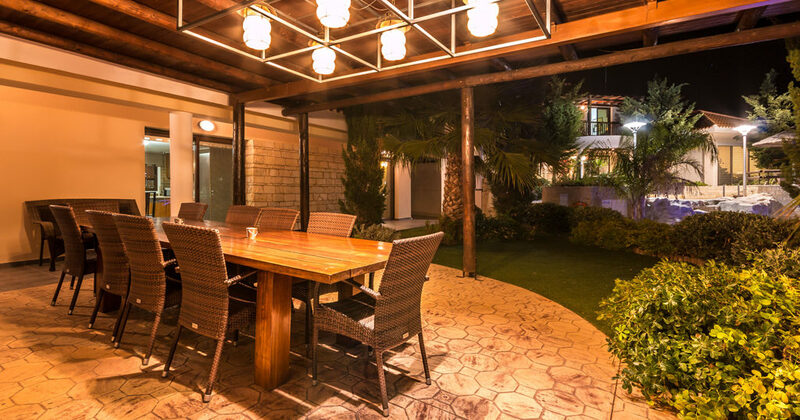 Two BBQ areas, one with a small BBQ grill and the other for bigger BBQ occasions, can be found within the spacious landscaped gardens, while on the terrace, you will find two large outdoor dining tables for a tranquil/serene wine and dine experience. Also, for yours and the little guests' entertainment, a table tennis is available. Panorama Villa is also offered for wedding ceremonies, since it is one of the best known wedding villas in Cyprus. Please view the Panorama Villa's Virtual Tour at HD Panorama Virtual Tour. 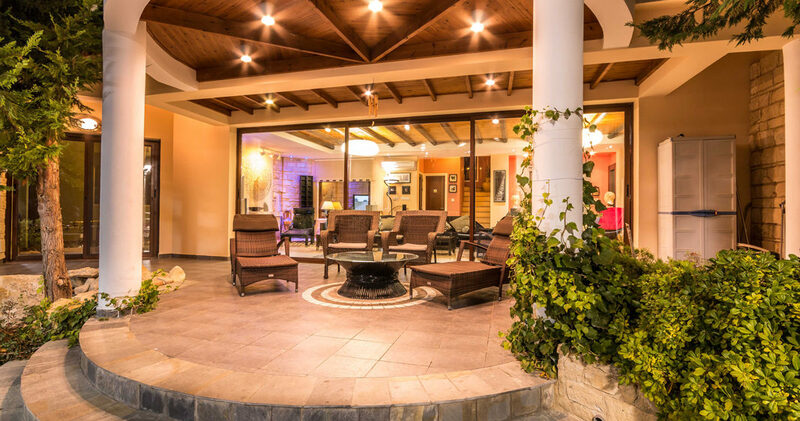 The villa is fully air-conditioned for both cooling and heating (see rental rates). Spacious Parking area is also available. A simple and easy to use safety deposit box is included within the villa for free. Use of the Jacuzzi must be booked in advance with a minimum of 4 days use. A baby cot and a high chair are available free of charge upon request. Only the number of guests specified on the booking form may be accommodated at the villa. Any extra guest aged 15 years and over, is subject to additional charge. 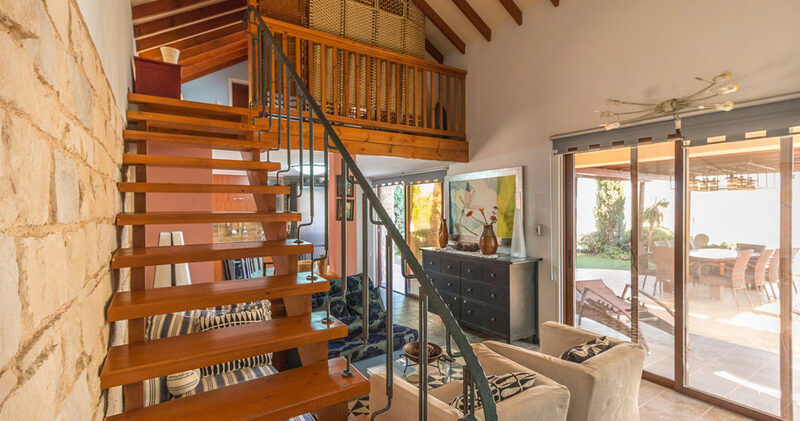 Sleeps: 15 Guests (Best ratio: 11 adults and 4 children). Air conditioning (for cooling and heating) is optional and payable in cash directly to the villa owner. The supplement for the outdoor Jacuzzi with spa is 65 Euros per day, payable directly to the villa owner. Please note that the Jacuzzi should be pre-booked as it can take up to 24-48 hours to heat. The Jacuzzi can be booked for a minimum of 4 days. A wedding surcharge is applicable of Euros 650.00 and is payable locally in cash upon arrival. Please note a refundable security deposit of GBP 650 is required to be paid by cash on the day of the accommodation. Paphos is one the most historical rich cities of Cyprus. It is said that the Greek Goddess of Love, Aphrodite, was born there. 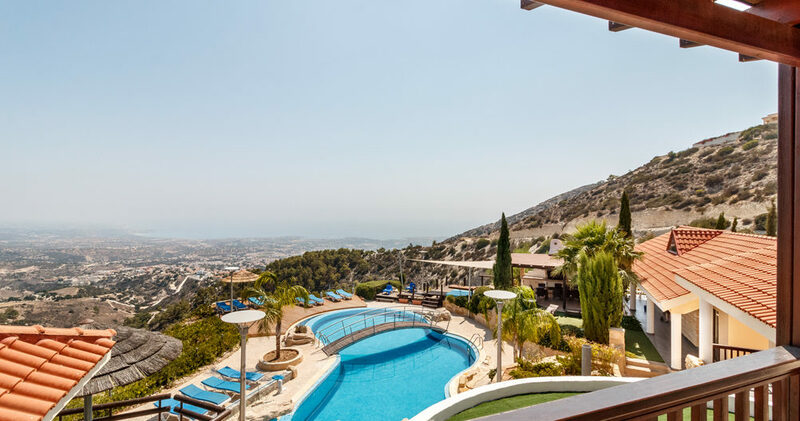 Paphos has its own airport, Paphos International Airport, with only 10km drive from the central of the city and 30 minutes' drive from the holiday villas, Panorama and Oceania. 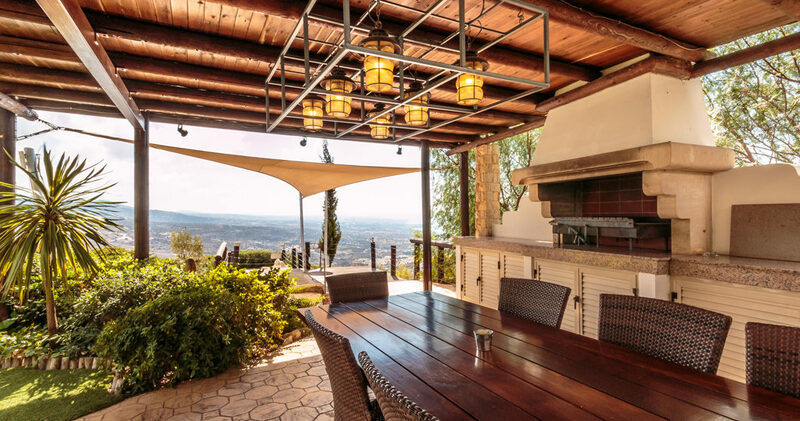 Since, in Cyprus the sun is out most of the year, the villas are the perfect destination for holidays with family or friends. 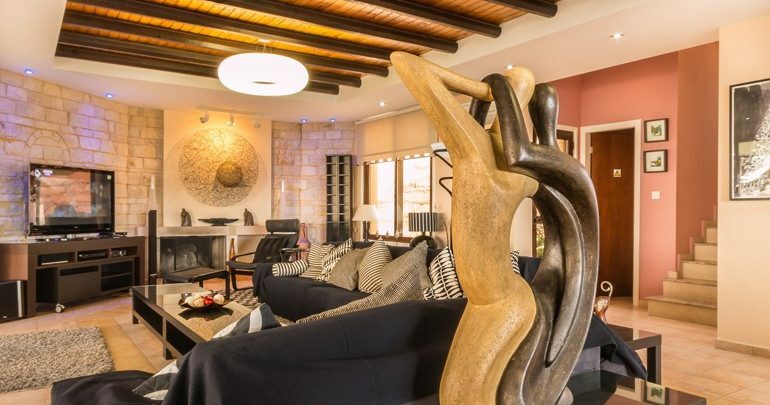 The two luxurious villas, Panorama and Oceania, are located in the rural Peyia Hills region, only a few minutes away from the central of Paphos. Since they are in a private location, they provide costal views and serenity that you will experience a holiday of a lifetime. 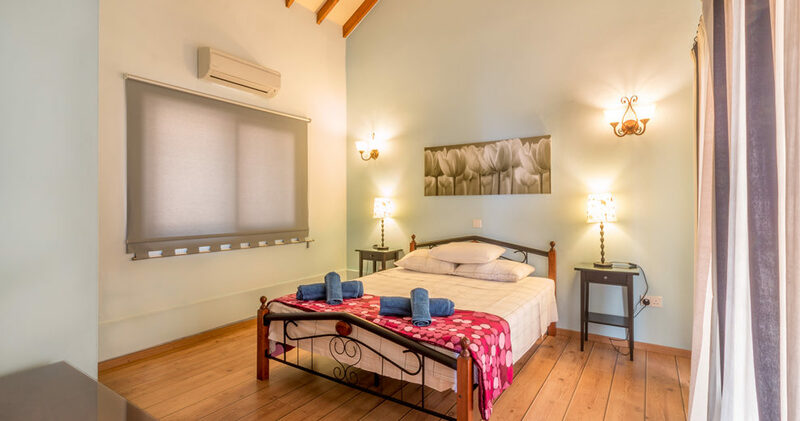 Peyia Village is only an 8 minutes' drive from the villas where you can find a lot of facilities such as supermarkets, pharmacies, banks, restaurants, traditional coffee shops ''Kafeneia'' and anything else that you might need during your stay at the holiday villas. 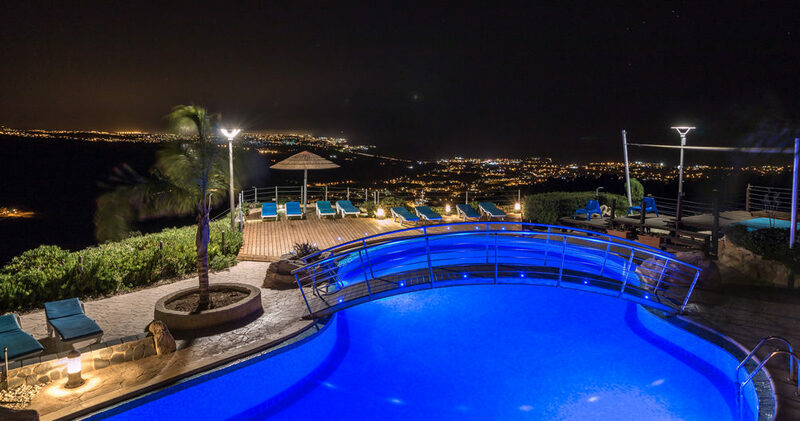 The city of Paphos, approximately 20km away, has various historical sites that you can explore, beaches, restaurants, traditional taverns to enjoy a Cypriot meze, bars and clubs and the Kings Avenue Mall, full of shops and restaurants. Also, you can visit the Paphos Harbour for his history but also for his livelihood, since it is full of bars and restaurants. The Aphrodite Waterpark and the archaeological site, Tombs of the Kings are also something worth to explore. You can also drive to Pikni Pine Forest for experiencing a traditional Cypriot BBQ or a picnic, all prepared by our professional catering team or you can explore Polis and Latsi cities since they are a 25 minutes' drive from the villas. Coral Bay is a tourist area full of bars and shops, restaurants, coffee shops and places for renting bikes, cars or motorbikes. You can find also sandy beaches where you can either sunbathing at the beach or if you are an adrenaline junkie, try some water-sports or take lessons of scuba diving. A few other facilities that you can find at Coral Bay are a horse riding school, a mini-golf centre, Go-Carting, spas and Paphos Zoo. Akamas Peninsula is one of the most valuable places of Cyprus since it is an ecological wild region and is under the protection of UNESCO. You can enjoy a trip to Lara Turtle Beach for your tranquillity or swim at the crystal water of Blue Lagoon or you can have a full of adrenaline adventure through its grounds. You can either rent a Jeep for a safari trip or a quad bike. Another landmark at Akamas Peninsula that you can visit is Aphrodite's Baths. According to Greek Mythology, the Greek Goddess used to bathe there. 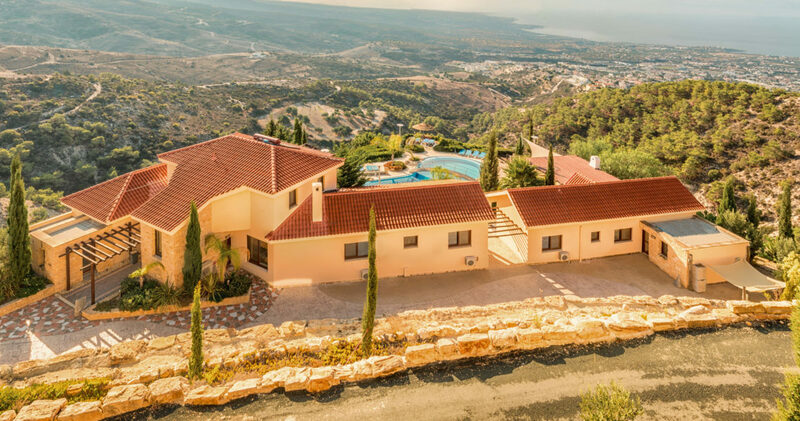 Location: Peyia Hills - Paphos City with coastal views and serenity throughout the grounds of the stunning villas. Airport: 30 minutes' drive from Paphos International Airport. Entertainment: Pubs, clubs, cinema, waterpark, surfing, scuba diving, snorkelling, zoo. Peyia Village: 8 minutes’ drive from the villas. Facilities: Supermarkets, pharmacies, banks, restaurants, traditional coffee shops etc. Pikni Pine Forest: Experience a traditional Cypriot BBQ or picnic, all prepared by our professional catering team. Paphos Zoo: The first biggest licensed zoo in Cyprus. The zoo is full of various animals and birds at their natural environment. 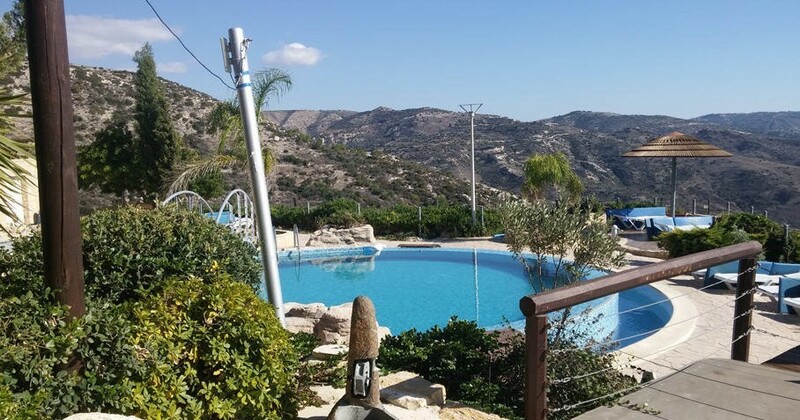 Coral Bay: A tourist area full of bars, shops, restaurants, coffee shops and places for renting bikes, cars or motorbikes, sunbathing at the sandy beaches of Paphos, water-sports, lessons of scuba diving, horse riding school, a mini-golf centre, Go-Carting, spas. Akamas Peninsula: An ecological treasure where you can enjoy planned safari trips, hiking or a full adrenaline drive with a quad bike. Aphrodite’s Baths: According to Greek Mythology, the Greek Goddess used to bathe there. Lara Turtle Beach: A protected site full of wild goats, birds and turtles. Tombs of the Kings: An archaeological side of underground tombs, dated back to the 4th Century BC. Kings Avenue Mall: Shops and restaurants. Paphos Harbour:	Explore the harbour’s history or have a nice meal, or a drink. Aphrodite Waterpark: Paphos’ waterpark, for a day full of games in the water for all ages. Aphrodite's Rock: A rock where it symbolizes the birthplace of Greek Goddess Aphrodite. Legend says that if someone swims three times around the rock then he/she will meet their true love. Golf courses: Four golf courses are available in Paphos; Aphrodite Hills, Minthis Hills Golf Club, Secret Valley Golf Club and Elea Golf Club. Kykkos Monastery: The most famous and richest monastery of Cyprus dating back at the 11th century, dedicated to the Virgin Mary. A perfect escape and a different relaxation from everything. Curium Amphitheatre: An open-air theatre dated back to the 2nd century that stills runs plays and musical performances. It is located between Limassol and Paphos. Troodos Mountain: A road trip to the biggest mountain of Cyprus to enjoy a walk in the nature and even have a Cypriot barbeque. Wine villages: If you are a wine lover then take a road trip to the various wine villages that Cyprus has to offer. Limassol Marina: Display of the parked yachts, restaurants, cafes and a bar. Absolutely beautiful , the villa interior design and space is awesome and the view totally relaxing from the lounging ,roof area or wimming in the hugh pool!! It's a must experence one day shopping list!!! The apartment has a good location. Close to the embankment that is good for walking. Nearby there are shops, pharmacies, supermarket. In 10 minutes by feet you can reach Debenhams. We had a nice walk every day for about 30 minutes to the Dasoudi beach. View from the flat is spectacular. The apartment is not big but comfortable. That was really very nice to have some welcome gifts (wine & fruits) upon arrival. We had got what we expected 100%. Thank you, Sevinos, for your hospitality!